We closed out another difficult April with Jonah’s seventh birthday party, an event that didn’t even have a coherent plan as late as one week beforehand. We didn’t have time to assemble and send one of our trademark clever party invitations, so we made do with an Evite. Once again the rightness of this idea was immediately apparent — as was the magnitude of the task ahead. Jonah’s guest list had the names of more than twenty six- and seven-year-olds on it. None of the families had yet attempted a sleepover with more than two guests at once. Our modest little house would barely contain them all while fast asleep, to say nothing of the wakeful hours before and after slumbering! And because we eschewed any location that might have provided its own Scooby-Doo-ish appeal — Alcatraz prison, an old movie house, a Victorian mansion, and the Ripley’s Believe It Or Not Museum were candidates — we’d have to stage our own mystery for the kids to solve. In the afternoon before the party began, as we were getting the house ready for the onslaught, Andrea emerged from the study holding a deck of playing cards. “Boys,” she said to Jonah and Archer, “was one of you playing with these cards and writing on the backs of them?” “No,” they both said. Andrea held them up. Sure enough, each card had a letter written in permanent marker on the back. “Someone wrote on the backs of these cards. It wasn’t either of you?” “No,” they insisted, puzzled. “That’s strange,” said Andrea. “Yeah, that’s weird,” said Jonah. The cake is all mine, ha ha ha! If you want to know where I took it, you’ll have to “puzzle” it out. Jonah was gobsmacked. “The cake was stolen!” he exclaimed and started looking for it all over the place. It was nowhere to be found. Meanwhile more guests arrived, and as soon as each one did, Jonah filled them in. “A villain stole the cake!” While they tried to figure out that mystery, there was pizza and there were hot-dog-pasta creatures. Then I realized something. “Jonah!” I said. “I think I understand what the villain meant by ‘puzzle it out’!” “What?” Jonah asked. I brought out five boxes, each containing a Scooby-Doo jigsaw puzzle. “I bought these for everyone to do around bedtime, but look! They’ve already been opened!” Jonah got the idea immediately. “Maybe the villain left a clue in the puzzles! Maybe we have to put the puzzles together!” So amidst the general seven-year-old-boy chaos five groups formed, one around each puzzle. 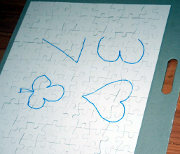 The puzzles were found to have some kind of design on the backs of the pieces, but they had to be assembled front-side-up first to make sense out of the markings on the back. “Let’s go to the playground!” Jonah announced. With some difficulty, Andrea and I and a few grownups who were helping us organized 16 kids for a raucous walk to the playground up the street in the gathering dark. Our friend Greg, who was also helping but whose foot was injured, stayed behind. Cake eating followed, accompanied by Scooby-Doo cartoons, changing into pajamas, and unrolling sleeping bags. After that was lights-out, carefully timed to coincide with a sugar crash, producing a trouble-free night of sound sleep for everyone — even Andrea and me. 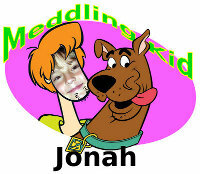 In the morning, each kid took home a personalized “Meddling kid” t-shirt with himself as Shaggy. Jonah was all smiles throughout the party and for hours afterward the next day. After the last guests left in the morning, and after I literally passed out for a couple of hours that afternoon, I remarked to Andrea that though I used to feel guilty at Halloween time (because our kids wear store-bought costumes, even though my mom used to make professional-quality ones by hand), I don’t feel guilty anymore. We have carved out a funmaking niche of our own in which we excel. Wow! That sounds like a pretty amazing party!